With the weather finally warming up hedgehogs are now out and about. You will probably know that the British hedgehog population has suffered a disastrous crash. It is estimated that there were 36 million hedgehogs in the 1950s and less than 1 million now. 10 million have been lost since 2003. What is the cause of this? Some people will have you believe that it is because of badgers. While badgers will eat hedgehogs when hungry research shows that in the past the level of badger predation on hedgehogs has been low because there were plenty of places hedgehogs could avoid badgers. Sadly, the loss of hedgerows and cover due to intensive farming means that cover for hedgehogs has declined. Badgers also prefer to eat earthworms but as intensive farming degrades the condition of soil the numbers of earthworms available for badgers, and hedgehogs, to eat decreases, resulting in hungry hedgehogs that starve and hungry badgers who will be happy to eat a hedgehog. Help hedgehogs to get around by giving them a safe route to travel between gardens. Gaps in fences and under gates allow hedgehogs to move between gardens. 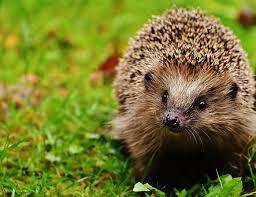 Routes that avoid roads protect the hedgehog from one of its major hazards – road traffic. Adding a 10cm hole at ground level is all you need – speak to your neighbours to see if they would also be willing to do the same. Even better, consider replacing fences with hedging – a native hedge is cheap to grow and will also support a lot of other wildlife. Also look for any hedgehog obstacles, such as steps, and provide little ramps for the hedgehogs. Stop using slug pellets. They poison hedgehogs and other wildlife – much of which would help you control slugs and snails. There are many other methods to control slugs and snails such as beer traps, empty grapefruit halves, egg shells, that do result in poisoned wildlife. Reduce the hazards to hedgehogs in your garden. Always check bonfires for hedgehogs before you light them. Take extreme care when using strimmers – these result in the serious injury and death of many hedgehogs. Also, if you are mowing long grass, check first for hedgehogs. If you have a garden pond make sure it has a hedgehog escape route in the event a hedgehog falls into it. To compensate for the loss of natural habitat provide hedgehog shelter in your garden. A wild corner sheltered from the wind and too much sun will do. Leave the grass to grow long and the weeds to become wild flowers. Provide a pile of twigs, dead wood or a log pile. You can even make or buy a weatherproof hedgehog shelter. Hedgehogs need to put on weight in the summer and autumn so they do not starve when they go into hibernation. To help them out why not feed them. Do not give them milk or bread as these will make them sick. 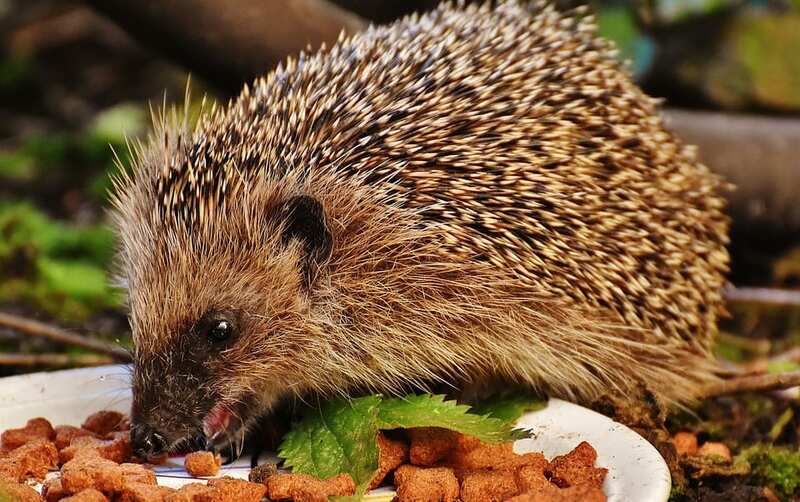 Safe food includes: any meat based cat / dog wet food (not fish based ones); hedgehog food / biscuits; kitten biscuits (chicken); sunflower seeds; nuts (not salted); suet pellets with insects. You can occasionally give them mealworms but while hedgehogs enjoy mealworms they are a poor source of nutrition for them. Don’t forget to provide fresh water. You may need to build a hedgehog feeding station to exclude foxes and cats from your hedgehog feast.